Identification of secreted proteins associated with obesity and type 2 diabetes in Psammomys obesus. Bolton K et al., Int J Obes (Lond). 2009 Oct;33(10):1153-65. doi: 10.1038/ijo.2009.148. Epub 2009 Jul 28. Skeletal muscle produces a variety of secreted proteins that have important roles in intercellular communication and affects processes such as glucose homoeostasis. The objective of this study was to develop a novel Signal Sequence Trap (SST) in conjunction with cDNA microarray technology to identify proteins secreted from skeletal muscle of Psammomys obesus that were associated with obesity and type 2 diabetes (T2D). Secreted proteins that were differentially expressed between lean, normal glucose tolerant (NGT), overweight and impaired glucose tolerant (IGT) and obese, T2D P. obesus were isolated using SST in conjunction with cDNA microarray technology. Subsequent gene expression was measured in tissues from P. obesus by real-time PCR (RT-PCR). The SST yielded 1600 positive clones, which were screened for differential expression. A total of 91 (approximately 6%) clones were identified by microarray to be differentially expressed between NGT, IGT and T2D P. obesus. These clones were sequenced to identify 51 genes, of which only 27 were previously known to encode secreted proteins. Three candidate genes not previously associated with obesity or type 2 diabetes, sushi domain containing 2, collagen and calcium-binding EGF domains 1 and periostin, as well as one gene known to be associated, complement component 1, were shown by RT-PCR to be differentially expressed in skeletal muscle of P. obesus. Further characterization of the secreted protein Postn revealed it to be predominantly expressed in adipose tissue, with higher expression in visceral compared with subcutaneous adipose depots. SST in conjunction with cDNA microarray technology is a powerful tool to identify differentially expressed secreted proteins involved in complex diseases such as obesity and type 2 diabetes. Furthermore, a number of candidate genes were identified, in particular, Periostin, which may have a role in the development of obesity and type 2 diabetes. Periostin, discovered by nano-flow liquid chromatography and mass spectrometry, is a novel marker of diabetic retinopathy. Takada M, et al., Biochem Biophys Res Commun., .2010 Aug 20;399(2):221-6. doi: 10.1016/j.bbrc.2010.07.058. Epub 2010 Jul 21. Diabetes can lead to serious microvascular complications including proliferative diabetic retinopathy (PDR), the leading cause of blindness in adults. Recent studies using gene array technology have attempted to apply a hypothesis-generating approach to elucidate the pathogenesis of PDR, but these studies rely on mRNA differences, which may or may not be related to significant biological processes. To better understand the basic mechanisms of PDR and to identify potential new biomarkers, we performed shotgun liquid chromatography (LC)/tandem mass spectrometry (MS/MS) analysis on pooled protein extracts from neovascular membranes obtained from PDR specimens and compared the results with those from non-vascular epiretinal membrane (ERM) specimens. We detected 226 distinct proteins in neovascular membranes and 154 in ERM. Among these proteins, 102 were specific to neovascular membranes and 30 were specific to ERM. We identified a candidate marker, periostin, as well as several known PDR markers such as pigment epithelium-derived factor (PEDF). We then performed RT-PCR using these markers. The expression of periostin was significantly up-regulated in proliferative membrane specimens. Periostin induces cell attachment and spreading and plays a role in cell adhesion. Proteomic analysis by LC/MS/MS, which permits accurate quantitative comparison, was useful in identifying new candidates such as periostin potentially involved in the pathogenesis of PDR. Identification of cardiovascular genes in omentum from morbidly obese patients with type 2 diabetes. Hindle AK, et al., 2010 Jun;34(6):1020-7. doi: 10.1038/ijo.2010.23. Epub 2010 Feb 16. The metabolic syndrome describes the association between obesity and co-morbidities including insulin resistance, hypertension, dyslipidemia, and cardiovascular (CV) disease. Adipokines produced from omentum contribute to the risk of CV disease and increase the inflammatory state. This study examines the gene expression differences in the omental tissue of morbidly obese diabetic and non-diabetic patients. Twenty morbidly obese patients undergoing bariatric surgery were included. Ten patients were diabetic and 10 were non-diabetic. Omental samples were collected intraoperatively and snap frozen. 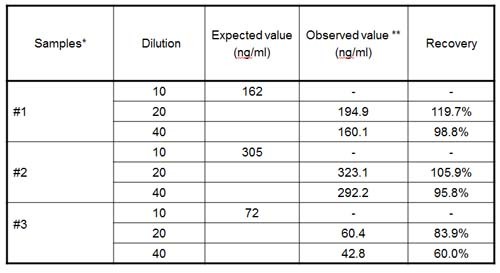 Total RNA was extracted using the Trizol reagent and purified with the RNeasy kit (Qiagen). Microarray experiments were performed using the Affymetrix Gene 1.0 ST array and data was analyzed with the Partek 6.3 program using an unpaired t-test (P<0.05). The gene expression profiles of the diabetic group were compared with the non-diabetic group. Using the Ingenuity program, the gene list generated from the microarray analysis was evaluated and real-time quantitative PCR (qPCR) was used to validate the array data. Compared with the non-diabetic group, the diabetic obese patients showed 79 upregulated genes and 4 downregulated genes with >1.4-fold difference in expression. Ingenuity analysis showed numerous dysregulated genes associated with CV disease including leptin, Von Willebrand factor, P-selectin, angiopoietin-1 (ANGPT1), phospholipase A2 (group VII), and periostin osteoblast specific factor. Microarray results for the earlier mentioned genes were confirmed with qPCR. The results were analyzed with respect to the presence or absence of hyperlipidemia, hypertension, and coronary artery disease. In patients with hyperlipidemia, ANGPT1 and P-selectin were upregulated 1.9- and 2.9-fold, respectively. 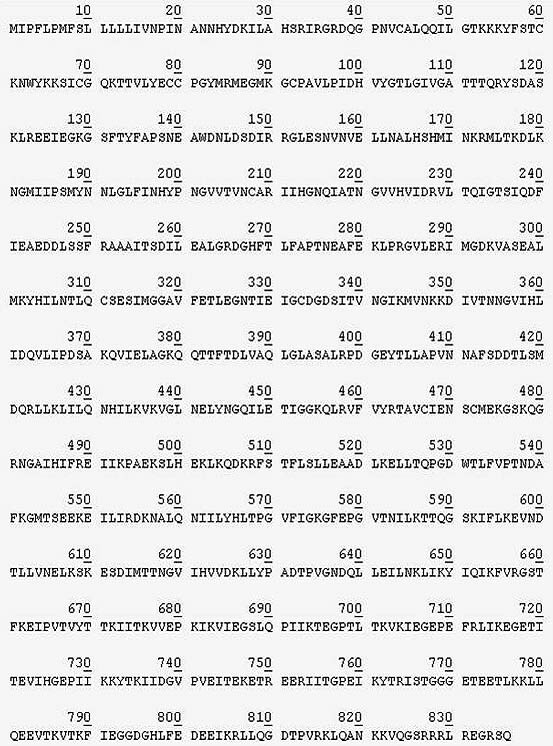 This microarray analysis of omental tissue from morbidly obese diabetic patients documents a host of upregulated genes related to CV disease. This study provides further evidence that diabetic status predisposes obese patients to a higher risk of developing CV disease. High glucose increases periostin expression and the related signal pathway in adult rat cardiac fibroblasts. Zou P, et al., Acta Physiologica Sinica, 2010 Jun 25;62(3):247-54. Cardiac fibrosis is a major mechanism contributing to myocardial systolic and diastolic dysfunction in diabetic cardiomyopathy. Periostin is a novel extracellular matrix protein, secreted from cardiac fibroblasts, and closely related with cardiac fibrosis and remodeling. The present study aimed to investigate the effect of high glucose on periostin expression and the related signal transduction pathway in cardiac fibroblasts. Adult rat cardiac fibroblasts were cultured and stimulated with high glucose (25 mmol/L). The mRNA and protein expressions of periostin were detected by RT-PCR and Western blot, respectively. Intracellular reactive oxygen species (ROS) production was measured using 2, 7-dichlorofluorescein diacetate (DCF-DA), an oxidant-sensitive fluorescent probe. Results showed that the mRNA expression of periostin in adult rat cardiac fibroblasts was increased by 117.26% when treated with high glucose for 12 h. Incubation with high glucose for 24 h enhanced periostin protein expression by up to 93.12%. High glucose induced the production of ROS in adult rat cardiac fibroblasts, which was reduced by chelerythrine (CLT), a protein kinase C (PKC) inhibitor. High glucose-induced periostin protein expression was decreased significantly when pretreated with CLT or N-acetylcysteine (NAC), a ROS scavenger. The phosphorylation of c-jun N-terminal protein kinase (JNK) was increased markedly when stimulated with high glucose for 30 and 60 min, which was abolished when pretreated with CLT or NAC. SP600125, a specific JNK inhibitor, significantly decreased periostin expression induced by high glucose. In conclusion, high glucose stimulates periostin protein expression via a PKC/ROS/JNK-dependent pathway in adult rat cardiac fibroblasts. Levels of blood periostin decrease after acute myocardial infarction and are negatively associated with ventricular function after 3 months. Cheng CW et al., J Investig Med. 2012 Feb;60(2):523-8. doi: 10.231/JIM.0b013e3182408549. A recent study showed that periostin (PN) induced reentry of differentiated cardiomyocytes into the cell cycle and improved heart function after acute myocardial infarction (AMI). This study sought to investigate whether PN levels increase after AMI and whether they provide prognostic value. We recruited 123 patients: 45 with AMI, 45 with stable coronary artery disease (CAD), and 33 healthy controls (CON). Blood PN and N-terminal pro-brain natriuretic peptide (NT-pro-BNP) levels were measured. Echocardiography was repeated 3 months after AMI. In the AMI group, the PN levels 1.3 ¡À 1.2 days after AMI were significantly lower than those in the CAD and CON groups (175 ¡À 60, 245 ¡À 68, and 232 ¡À 63 ng/mL, respectively, P = 0.001). The NT-pro-BNP levels were significantly higher in the AMI group, compared to the CON and CAD groups (10.07 ¡À 28.2 [median, 0.70] vs 0.08 ¡À 0.06 [median, 0.05] and 1.1 ¡À 4.2 [median, 0.09] ng/mL, respectively; P = 0.02). The PN levels further decreased 8 ¡À 2 days after AMI (from 175 ¡À 60 to 143 ¡À 57 ng/mL; P = 0.003). However, NT-pro-BNP levels did not significantly change. With respect to the echocardiographic parameters 3 months after AMI, the PN levels measured before discharge were negatively associated with the left ventricular ejection fraction (rs = -0.50; P = 0.001), end diastolic (rs = 0.42; P = 0.009) and systolic (rs = 0.46; P = 0.004) diameters. The NT-pro-BNP levels were not significantly correlated with these parameters. Acute myocardial infarction is associated with a decrease in blood PN levels, and PN concentrations predict cardiac function 3 months after AMI. The adult heart responds to increased workload with physiologic hypertrophy, cardiac stem cell activation, and new myocyte formation. AimsIt is a dogma of cardiovascular pathophysiology that the increased cardiac mass in response to increased workload is produced by the hypertrophy of the pre-existing myocytes. The role, if any, of adult-resident endogenous cardiac stem/progenitor cells (eCSCs) and new cardiomyocyte formation in physiological cardiac remodelling remains unexplored.Methods and resultsIn response to regular, intensity-controlled exercise training, adult rats respond with hypertrophy of the pre-existing myocytes. In addition, a significant number (~7%) of smaller newly formed BrdU-positive cardiomyocytes are produced by the exercised animals. Capillary density significantly increased in exercised animals, balancing cardiomyogenesis with neo-angiogenesis. c-kit(pos) eCSCs increased their number and activated state in exercising vs. sedentary animals. c-kit(pos) eCSCs in exercised hearts showed an increased expression of transcription factors, indicative of their commitment to either the cardiomyocyte (Nkx2.5(pos)) or capillary (Ets-1(pos)) lineages. These adaptations were dependent on exercise duration and intensity. Insulin-like growth factor-1, transforming growth factor-β1, neuregulin-1, bone morphogenetic protein-10, and periostin were significantly up-regulated in cardiomyocytes of exercised vs. sedentary animals. These factors differentially stimulated c-kit(pos) eCSC proliferation and commitment in vitro, pointing to a similar role in vivo. Conclusion: Intensity-controlled exercise training initiates myocardial remodelling through increased cardiomyocyte growth factor expression leading to cardiomyocyte hypertrophy and to activation and ensuing differentiation of c-kit(pos) eCSCs. This leads to the generation of new myocardial cells. These findings highlight the endogenous regenerative capacity of the adult heart, represented by the eCSCs, and the fact that the physiological cardiac adaptation to exercise stress is a combination of cardiomyocyte hypertrophy and hyperplasia (cardiomyocytes and capillaries). Metabolic characterization of volume overload heart failure due to aorto-caval fistula in rats. Melenovsky V et al, Mol Cell Biochem 2011 Aug;354(1-2):83-96. doi: 10.1007/s11010-011-0808-3. Epub 2011 Apr 5. Metabolic interactions between adipose tissue and the heart may play an active role in progression of heart failure (HF). The aim of the study was to examine changes in myocardial and adipose tissue metabolism and gene expression in a rat HF model induced by chronic volume overload. HF was induced by volume overload from aorto-caval fistula (ACF) in 3-month-old male Wistar rats and animals were studied in the phase of decompensated HF (22nd week). HF rats showed marked eccentric cardiac hypertrophy, pulmonary congestion, increased LV end-diastolic pressure, and intraabdominal fat depletion. HF rats had preserved glucose tolerance, but increased circulating free fatty acids (FFA) and attenuated insulin response during oral glucose challenge. Isolated organ studies showed preserved responsiveness of adipose tissue lipolysis and lipogenesis to epinephrine and insulin in ACF. The heart of HF animals had markedly reduced triglyceride content (almost to half of controls), attenuated anti-oxidative reserve (GSH/GSSG), upregulated HF markers (ANP, periostin, thrombospondin-4), specific signaling pathways (Wnt, TGF-β), and downregulated enzymes of mitochondrial fatty acid oxidation, citric acid cycle, and respiratory chain. Adipose tissue transcription profiling showed upregulated receptor for gastric inhibitory polypeptide. In conclusion, ACF-induced HF model displays several deregulations of systemic metabolism. Despite elevation of systemic FFAs, myocardial triglycerides are low and insulin levels are attenuated, arguing against a role of lipotoxicity or insulin resistance in this model. Attenuated postprandial insulin response and relative lack of its antilipolytic effects may facilitate intraabdominal fat depletion observed in ACF-HF animals. Serum periostin levels are correlated with progressive skin sclerosis in patients with systemic sclerosis. Periostin, a matricellular protein, serves as a regulator of wound healing and fibrosis. The role of periostin in the pathogenesis of systemic sclerosis (SSc) is unknown. 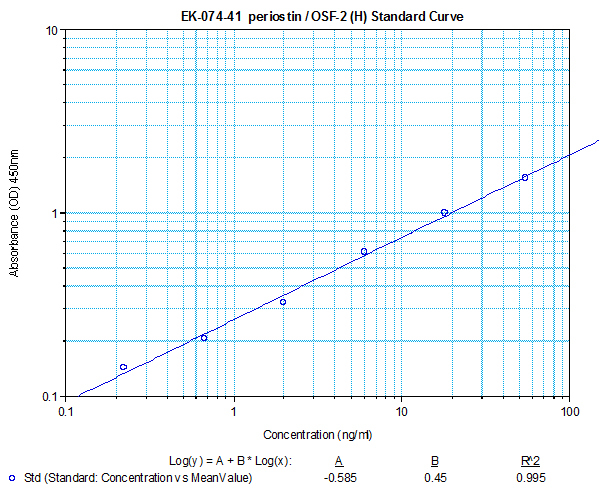 Objective: To determine periostin levels in association with severity of skin fibrosis in patients with SSc. Expression of periostin was immunohistochemically examined in the skin obtained from SSc patients and healthy controls. Enzyme-linked immunosorbent assay was performed to evaluate serum periostin levels in association with clinical characteristics in 56 patients with SSc (diffuse cutaneous SSc (dSSc), n=16; and limited cutaneous SSc (lSSc), n=40) and 66 healthy controls. Periostin was strongly expressed in the affected dermis from SSc patients. Periostin was co-localized in α-SMA-positive myofibroblasts and PECAM-1-positive endothelial cells in SSc dermis. Serum levels of periostin in dSSc patients were markedly elevated compared to those in lSSc patients and control subjects. Patients with lSSc had increased periostin levels compared with healthy controls. In addition, significantly higher levels of periostin were observed in dSSc patients with disease duration ≤5 years compared with those with disease duration >5 years. Furthermore, the modified Rodnan total skin thickness score (MRSS) was positively correlated with periostin levels in SSc patients. Serial analysis revealed a correlation between periostin and MRSS; namely, MRSS decreased in line with decreased periostin levels in some dSSc patients as the disease progressed. An elevated periostin level in SSc patients was associated with severity of skin sclerosis. Periostin may be a potential biomarker for progressive skin fibrosis in SSc. Identification of periostin as a critical marker of progression/reversal of hypertensive nephropathy. Progression of chronic kidney disease (CKD) is a major health issue due to persistent accumulation of extracellular matrix in the injured kidney. However, our current understanding of fibrosis is limited, therapeutic options are lacking, and progressive degradation of renal function prevails in CKD patients. Uncovering novel therapeutic targets is therefore necessary. We have previously demonstrated reversal of renal fibrosis with losartan in experimental hypertensive nephropathy. Reversal was achieved provided that the drug was administered before late stages of nephropathy, thereby determining a non-return point of CKD progression. In the present study, to identify factors critically involved in the progression of renal fibrosis, we introduced losartan at the non-return point in L-NAME treated Sprague Dawley rats. Our results showed either reversal or progression of renal disease with losartan, defining 2 groups according to the opposite evolution of renal function. We took advantage of these experimental conditions to perform a transcriptomic screening to identify novel factors potentially implicated in the mechanisms of CKD progression. A secondary analysis of selected markers was thereafter performed. Among the targets identified, periostin, an extracellular matrix protein, presented a significant 3.3-fold higher mRNA expression in progression compared to reversal group. Furthermore, independent of blood pressure, periostin was strongly correlated with plasma creatinine, proteinuria and renal blood flow, hallmarks of hypertensive renal disease severity. Periostin staining was predominant in the injured regions, both in experimental hypertensive and human nephropathy.These results identify periostin as a previously unrecognized marker associated with disease progression and regression in hypertensive nephropathy and suggest measuring periostin may be a sensitive tool to evaluate severity, progression and response to therapy in human kidney disease associated to hypertension. Matrix metalloproteinases (MMPs) play a key role in cardiovascular disease, in particular aneurysm formation and plaque rupture. Surprisingly little is known about MMP substrates in the vasculature. We used a proteomics approach to identify vascular substrates for three MMPs, one of each of the three major classes of MMPs: Human arteries were incubated with MMP-3 (a member of stromelysins), MMP-9 (considered a gelatinase) and MMP-14 (considered a member of the collagenases and of the membrane-bound MMPs). Candidate substrates were identified by mass spectrometry based on 1) increased release from the arterial tissue upon digestion, 2) spectral evidence for proteolytic degradation after gel separation, and 3) identification of non-tryptic cleavage sites. Using this approach, novel candidates were identified, including ECM proteins associated with the basement membrane, elastic fibers (emilin-1) and other extracellular proteins (periostin, tenascin-X). 74 non-tryptic cleavage sites were detected, many of which were shared among different MMPs. The proteomics findings were validated by immunoblotting and by digesting recombinant/purified proteins with exogenous MMPs. As proof-of-principle, results were related to in vivo pathology by searching for corresponding degradation products in human aortic tissue with different levels of endogenous MMP-9. The application of proteomics to identify MMP targets is a new frontier in cardiovascular research. Our current classification of MMPs based on few substrates is an oversimplification of a complex area of biology. This study provides a more comprehensive assessment of potential MMP substrates in the vasculature and represents a valuable resource for future investigations. ** Varying concentrations of periostin were spiked into diluted human plasma which divided into three groups. Data is presented after the un-spiked plasma value is subtracted. Tips: See More Research Abstracts, Immunoassay Kits Curves and Sequences by clicking the tabs on the top.